Aerial view of Marcell Experimental Forest, the S1 Bog, and SPRUCE experimental chanbers. August 2015. EcoPAD is an interactive Model-Experiment (ModEx) system that assimilates various data streams into models in a rigorous way to constrain model parameters and system states, improve ecological prediction, and quantify associated uncertainty. The system provides feedback to experimenters on which data sets are needed to further improve model predictions and to modelers on which parts of a model need to be improved. Predict what ecosystems may respond to treatments once you selected a site and decide your experimental plan. Assimilate data you are collecting along your experiment to constrain model prediction. Project what ecosystem responses may likely be in the rest of your experiment. Tell you what are those important datasets you may want to collect in order to understand the system. Improve the models, the data assimilation system, and your experiments during the process. EcoLAB assimilates multiple streams of data from the SPRUCE experiment to the TECO model using MCMC algorithm, and then makes forecasts of ecosystem dynamics. Effects of warming and elevated [CO2] on carbon fluxes and pool sizes are forecast. These data are provided in support of the SPRUCE publication, Stability of peatland carbon to rising temperatures, Wilson et al., (2016). 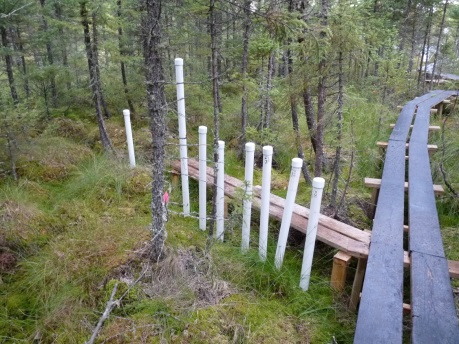 This data set reports the results of extensive field measurements and laboratory analyses of samples from the SPRUCE experiment. Results indicate that ecosystem-scale warming of over 2 m of peat exponentially increased CH4 emissions —but not ecosystem respiration of CO2. Multiple lines of evidence, including incubations and in situ analyses of 14C, dissolved gases, and microbial community metabolic potential, indicate that CH4 emissions increased due to surface processes and not degradation of deeper buried carbon. The supporting data provided include the summarized and aggregated data used to generate the six figures in the main text of the paper and the 12 supplementary figures. This data set reports the chemistry of porewater in the SPRUCE plots located in the S1 bog. Sample collection and analyses started in August of 2013 and will continue for the duration of the experiment. Results will be added to this data set and released to the public periodically as quality assurance and publication of results are accomplished. These data are the pre- and post-treatment data from the warming and elevated CO2 treatments associated with the SPRUCE experiment. There are 10 experimental plots in SPRUCE: 5 temperature treatments (+0, +2.25, +4.5, +6.75, +9°C) at ambient CO2, and the same 5 temperature treatments at elevated CO2 (+500 ppm). There are 7 additional ambient plots without experimental enclosures, and thus a total of 17 plots. This data set reports the chemistry of S1 Bog porewater, outlet stream water, and groundwater from upland wells from 2011 through 2013. These data provide information for studies of the biogeochemical status of the bog and surrounding groundwater aquifer. OUR CHANGING PLANET -- The U.S. Global Change Research Program for Fiscal Year 2017. SPRUCE highlighted on Page 9.